A few months ago I wrote a blog post describing my personal struggle with depression. That post was the first time many people who know me realized that I was struggling with depression. Friends reached out offering support and about 10 people shared with me their own experience with depression. All of a sudden I wasn’t alone. Without intending to I had built a support community for myself and a network of others who share the same struggle. This support community has been enormously helpful in avoiding depressive episodes and working through them when they do happen. It has been a life line and helped me to realize that I am among a huge, hidden group of people struggling with an atypical neurology and the data supports it. Over 20% of people experience a brain condition and that number jumps 2x in the tech industry. So I began to wonder, if I only found this community because of my blog post, where is everyone else finding support? Through my work at Techstars, I found Sigmend’s Open Labs whose founders graduated from our Boulder Accelerator in 2016. They have since built a nonprofit support system that focuses on people with a bipolar neurology. Open Labs creates a line for people who are bipolar to communicate and support each other. They talk about bipolar as a neurotype that falls within the set of natural human variation instead of a pathology or disorder that should be cured. The goal is to create a safe and empowering environment for those who impacted by bipolar to thrive, and give them the hope they need to live openly. There is often little consideration for how to live with neurologically different people, the focus is mostly on pushing them back into the “normal” bucket. I don’t believe this is the right way to treat any type of diversity. Diversity fundamentally should be celebrated. Neurodiversity is no different. People whose minds work differently than the median neurology are very valuable to society the way they are. Finding ways to help individuals with neurological differences embrace their differences as an asset is much more productive than considering all neurological differences a problem. I’ve also chosen to join Sigmend’s Open Council, a group of people who lend our names and expertise to the Open Labs mission to support the practice of open conversations about brain health in and beyond the workplace. If you are impacted by bipolar neurology or know someone who is, I encourage you to share Open Labs with them. Being open about depression significantly improved my ability to effectively deal with the condition. Open Labs does the same for those who are on the bipolar spectrum and their allies. Every day the news lists terrible events. Mass shootings, government destabilization, tensions rising. It paints this picture that the world is getting more and more troubling and that we are headed towards a future that is worse than the past. Here's my theory. The world is not getting worse. We are simply hearing about the problems in the world more loudly and frequently than ever before. More victims of violence and injustice have a voice today than they ever have had in the past. These voices are what we are hearing. 50 years ago we didn't hear the voices of sexual assault victims. 50 years ago we didn't hear the voices of people in villages exploited by large industrial companies. 50 years ago we simply didn't hear all the pain going on in the world. Now we do. Hearing all the pain in the world has fast-tracked our ability to address it. The evidence of global improvement is palpable in every meaningful measure of the quality of life globally. Child deaths before the age of 5 are the lowest they have ever been. More people in the world are living under a democratic government than ever before. The smallest fraction of people ever currently live below the poverty line. Our World in Data breaks a lot of these very important measures of global quality of life down quantitatively. 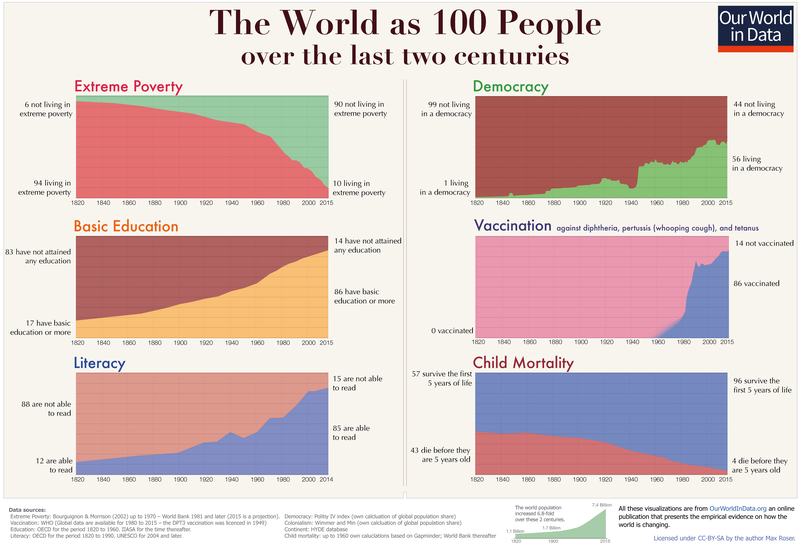 I really love this article on Our World in Data which argues for optimism in a rapidly improving world. What we are feeling in the world today is not a breakdown. It's very rapid improvement. How often do you look at a clock? Weekdays for me it can't be less than once every 5 minutes. The granularity with which I schedule things during the week is usually in 30-minute blocks although sometimes as narrow as 15-minute blocks. On weekends I try not to schedule anything with a precision greater than half a day. Meaning I could make a morning and afternoon plan, but won't schedule anything at a specific time. Though I will still look at a clock about every hour just to feel grounded. Every once and a while I pick up a book that I just can not put down before finishing, this happened with The Time Keeper by Mitch Albom. Through a fictional story, he explores the world before timekeeping and the first people who start counting the days, hours and seconds. Reading the book has made me really aware of how powerful a role timekeeping plays in modern life. I've been wondering what it would be like to not look at a clock for something like an entire week. Normally I'll follow a clock to know what I'm supposed to be doing now and what I'll be doing next. It would be a really interesting experiment to instead work on things at my internal pace. Changing activities when I feel like I've spent enough time on whatever I'm currently doing. I certainly think this would reduce anxiety. Although it would make it very difficult to work effectively with others who expect things to happen at a specific time. I'm considering blocking a day on my calendar every week to simply follow my internal clock. Life is not all instagram moments. It's becoming more difficult to ignore the picture perfect lives friends seem to live through their instagram feeds. It's 4am and I'm in the airport heading home from California. I spent the last few days as a tourist on the Pacific coast. It seemed like everywhere we went people's first priority was taking pictures. Moving on from a spot once they got a good shot. Focused on capturing the moment more than living it. Photos are great because they help us remember a moment. They are not the moment. Instagram glamorizes the visually pleasing moments. But these easy moments aren't what makes life full. The best parts of life aren't easy. You've heard this. And it's worth remembering in the age of instant gratification. Many of my best memories and most fulfilling expirences were gruelingly difficult. There is this natural desire to remove difficulty from our lives one piece at a time. But lean in to the difficult. Embrace the challenge. Listen to that part of your brain that knows the right thing to do, not just the easiest thing to do. The right thing will be hard. Having a difficult conversation with a loved one, fighting for what you feel like you deserve. This stuff is what makes you grow. What makes life full. Looking like you have a great life is not having a great life. All we get is now. We never experience tomorrow or yesterday. So focus less on capturing and more on living. Yes I got many photos of the beach this weekend. But I also tried to take some of myself and friend smiling in a random moment. The pictures of the beach will remind me of my vanity. And the pictures of us smiling will remind me of joy. What's Going on With David? If you've seen me in the past week, you could probably tell that something was off. I'm not normally the most jubilant person in the world, but I like to laugh and smile as much as anyone else does. Additionally, I love to see others smile and I believe spreading joy is one of the most fulfilling things we humans can do. This last week I haven't laughed. I haven't smiled. And I certainly haven't made anyone else laugh or smile. My world has been colored gray, and I've just gone through the motions. So what's going on? On and off for most of my life, I've struggled with depression. It's a hard thing to admit. And up until recently, I had never used the word depressed to describe myself or the way I've felt. Actually using the word is pretty scary but also feels relieving. My depression is episodic. Meaning it occurs for short periods of time. Usually, a few days or a few weeks in length and then I return to normal. The time in between episodes is usually months. Overall I spend more time feeling good than depressed. This is something I've been tracking with the happiness tracker here on my blog. It's easy to see an increase in my happiness over the last year. If I've blown you off in the past week, or just seemed cold and uninterested. Please reach out again. Thank you for bearing with me during the hard times. I really do look forward to the good times, which I've learned are never as far away as they feel. When I am depressed I am locked in my own world. Prevented from having the empathy needed to see into the lives of those around me. This is truly the most difficult part of depression and can make me feel very alone. That wasn't the case this time. This week I was pulled out of the rabbit hole really quickly by a couple amazing people. To those who have given their time to listen to and mentor me, your investment is treasured. And your belief in me has changed my perception of myself. If you are struggling with depression and keep it to yourself, consider sharing with friends and family what you are going through. There should not be any shame associated with your mental health and it will make recovery many times easier. If you don't know where to start, talk to me. I'll listen.